TYRONE McKenna is eyeing an Irish title following the successful defence of his BUI Celtic Nations light-welterweight title against Jake Hanney on Friday. The rangey southpaw gradually took control against the Dubliner but had to come through some adversity with a head clash in the second opening a nasty gash over his left eye, but McKenna prevailed with referee, David Irving stopping the bout in the sixth with McKenna landing heavy shots at will. “It was a great fight. Jake brought a lot more to the table than I thought,” said the West Belfast man after. “I make it hard work myself by loading up and trying to take him out of there. It did take McKenna a little while to find his range as he was off target in the first slightly, but by the second had begun to judge the distance well with the round ending in a firefight following the head clash. While Hanney was game and looked to trade at every opportunity, McKenna’s long reach was in play and he was starting to land with crisp shots that were forcing Hanney back and in the fifth he landed with a brilliant right followed by two straight lefts before an assault in the sixth forced the bout to be waved off. “I was just loading up too much in the first and second rounds, so Danny (Vaughan, trainer) told me to keep my distance and box,” said ‘The Mighty Celt’ after. Next up the 27 year-old is hoping to push on and get his hands on another title belt with the full Irish title possibly up for grabs against highly-ranked opposition. 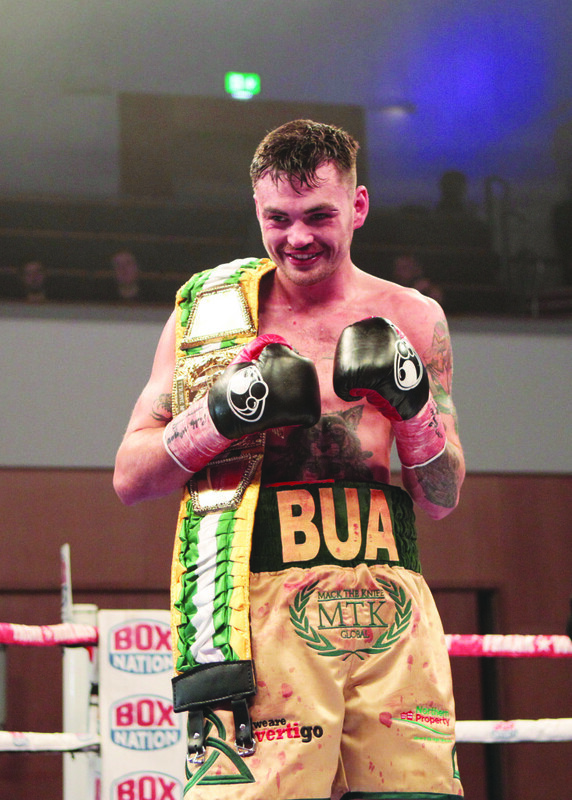 “I would love to step it up with an Irish title or the British Board’s Celtic title. I just want big fights, I don’t mind who it is,” he stressed. “It used to be the Irish title was a prospect against an opponent, but now it’s competitive and means something which is great to see. Sutcliffe was also in action on Friday with a fourth round stoppage win over Miguel Aguilar. The towel came in from the Nicaraguan’s corner with 2:33 gone in the round.